Water is essential to life, and the number of risks that affect the availability of our most precious resource is increasingly coming to the general public’s attention. 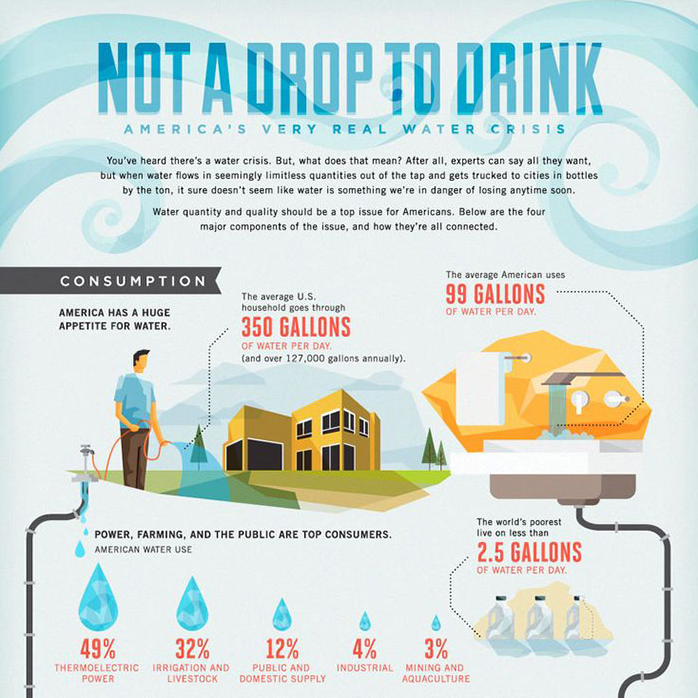 As this interesting infographic breaks it down, water quality and quantity should be a top issue, and there are four major components of how water issues in the United States are connected. 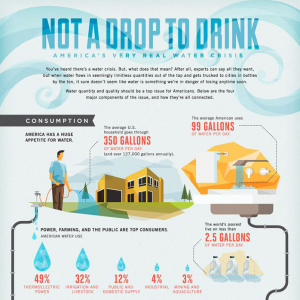 While there is an increasing national effort to be greener, the average American still uses 99 gallons of water per day, and the average household uses over 127,000 gallons of water annually. Compare that to the world’s poorest that lives on less than 2.5 gallons of water a day. The American public is the third highest consumer of water, only behind thermoelectric power and farming, using 12% of water resources. It’s important to know how much water is being used in day-to-day activities in order to better conservation efforts. This applies not only to the water we see, but also the water that goes into producing or powering items that we don’t explicitly think of having a water connection. For example, a 60-watt light bulb can use up to five gallons of water for every hour it’s left on, so just flipping a switch can help to conserve both water and electricity. It’s the little things that can make a big difference. In addition to behavior changes, installing water-efficient appliances and fixtures reduces household water usage without making lifestyle changes. By installing water-efficient appliances, daily water usage can be cut by up to 35%. Outside of home and businesses, the preservation and restoration of water sources is also something to be mindful of. Source water protection projects and activities can result in the protection or improvement of community drinking water supplies. Likewise, projects that focus on activities to improve, restore, or protect watersheds can make a real difference on the water ecosystem. Examples of activities that anyone can get involved in include habitat restoration, wildlife protection, watershed cleanups, and wellhead protection initiatives. And if getting out into the woods and streams isn’t your thing, it’s easy enough to learn how to help with local hazardous waste collection efforts, and how to dispose of potentially harmful household items and pharmaceuticals properly. Our aging infrastructure is problematic as well. Every day, 700 water mains break in the U.S., and an estimated 700 billion gallons of water are leaked every day. Fixing the nation’s infrastructure is no cheap feat, at an estimated cost of $1 trillion dollars over the next quarter century according to the American Water Works Association. There are many moving parts to the water crisis today from quantity and quality to infrastructure but there can be improvements made to each level of these issues. By creating awareness about the challenges that we are facing when it comes to the water crisis, we can drive the movement for a solution.